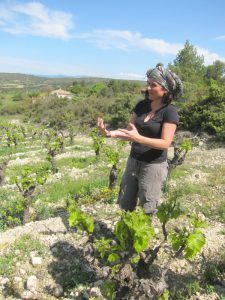 Mylène grew up in Corbières which is not very far from where she currently maintains her stunningly beautiful vineyards.Mylène runs a small biodynamic, 5 hectare vineyard in the mountains behind the Mediterranean port of Sete in the commune of Saint-Pargoire. Here she grows Grenache, Syrah, Carignan and Cinsault with small amounts of a very rare grape from the Rhone called Aubun as well as Marselan and Tempranillo. She also has a plot of 50 year old Chasselas which is very unusual for the Languedoc. 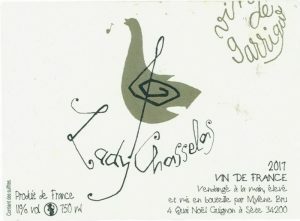 From this grape she makes a delicate white wine which she calls Lady Chasselas. Chasselas is better known in the Haute-Savoie in eastern France, in the obscure appellation of Pouilly-sur-Loire in the Loire Valley near Sancerre where it is the only permissible grape variety, and in Switzerland. The wind can be quite strong here so the vines are kept close to the ground and many are left as ‘bush’ vines without any supporting wires. This is reasonably common in the Languedoc. 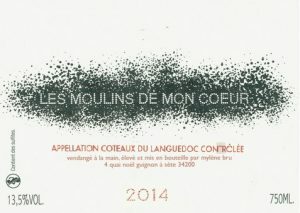 In addition to the Lady Chasselas, Mylène makes three cuvées of red wine namely Les Moulins de Mon Coeur which is a blend of Cinsault, Carignan and Syrah, Far-Ouest which is a blend of all of her red grape varieties and Rita (named after her grandmother) which is made from old-vine Carignan. These are all very expressive wines in which you can literally taste the ‘garrigue’, the local name for the herbs that dominate the vineyard. Mylène never filters or fines her wines and she adds only minimal amounts of sulphur and sometimes none. This wine is made from the Chasselas grape variety which is more commonly associated with Switzerland, hundreds of kilometres to the east. The plot where Mylène has her Chasselas vines is a site of amazing beauty. There is a long view over the short-cropped vines to the mountains beyond. The vines are at least 50 years old and face East North East. Chasselas is almost unknown in this region so this is a very rare wine, but one of some delicacy and with a really lovely mouth-feel. The clay and limestone soils give the wine a persistent minerality that is very appealing. The finish is quite dry. This wine has no added sulphites. The story behind this wine is very special. This is a beautiful, silky Grenache that used to always feature on the wine list at the famous Garagistes in Hobart. This wine is made from grapes picked from Mylène’s stunning vineyards in the hills behind the Languedoc seaside village of Sete. Mylène normally produces blended red wines, but in seasons when the Grenache ripens perfectly and when the grapes are very healthy she loves to make a wine from 100% Grenache. She calls the wine Violet de Mars. The vines grow on crumbly clay and limestone soils on slopes which face north and north east providing protection from the hot summer sun. The vineyards are ploughed by horse to avoid compacting the soils. The grapes are picked by hand to ensure they are in good condition and then fermented on their skins for between 10 to 20 days. 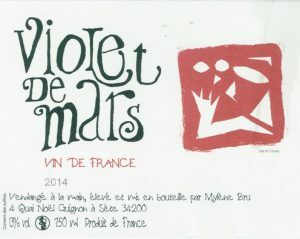 The wine is then matured in tanks until March (Mars) when the wine has become quite purple (Violet). This a pretty, elegant and delicious red wine. 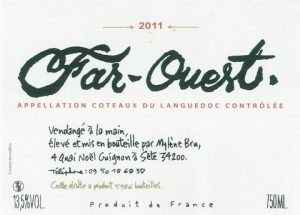 Far-Ouest has a film connection because of Mylène’s passion for film from an early age. She loved Clint Eastwood in ‘The Good, The Bad and The Ugly’ and also admires French New Wave director Francois Truffaut who used the metaphor of the Wild West to shape his films. It is a blend of all the red grapes so it has some Grenache, Syrah, Carignan and Cinsault but might also have a little Marselan and Aubun (an obscure grape from the Vaucluse) depending on the vintage. This fresh, lively red wine was made from whole bunches placed in fibreglass tanks so that Mylène can easily see what is happening to the wine. She placed a layer of Cinsault then a layer of Carignan and then a layer of Syrah and repeated this until the tank was full. Maceration took six days before pressing. The resulting wine has an amazing depth of colour, beautifully fine tannins and a lovely up-front freshness. This wine would go very well with steak grilled over charcoal or a meat braise such as a navarin of lamb or even a cassoulet. It is so good to see this wine back in our warehouse. This is one of the most beautiful Carignan wines we have ever tasted. If you like Carignan then this is a wine you simply must try! 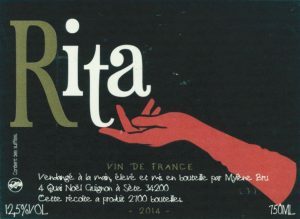 The Rita is named after Mylène’s Andalusian grandmother and also St Rita the saint of desperate causes! The wine is made from 100% Carignan from 50 year old vines which is not unusual in her area because it is quite close to Saint Chinian where Carignan is revered. The grapes were hand picked in the cool of the morning and placed in 10 kilogram baskets to preserve the quality of the fruit. The juice was macerated for approximately 20 days to extract the deep colour of this wine which then matured for 10 months in tanks before being bottled with a very small amount of sulphur this year. This is a special wine made by Mylène from a special north facing plot of Syrah that she has near her ‘hut’ in the vineyard. The vineyard is very windy so the grapes have to fight hard to survive here. There is also some forest here that shade the vines meaning that they they ripen slowly. This is a straight Syrah.